In basketball, a field goal is a basket scored on any shot or tap other than a free throw, worth two or three points depending on the distance of the attempt from the basket. Uncommonly, a field goal can be worth other values such as one point in FIBA 3x3 basketball competitions or four points in the BIG3 basketball league. "Field goal" is the official terminology used by the National Basketball Association (NBA) in their rule book, in their box scores and statistics, and in referees' rulings. The same term is also the official wording used by the National Collegiate Athletic Association (NCAA) and high school basketball. Kareem Abdul-Jabbar holds the NBA record for field goals made in a career with 15,837. Wilt Chamberlain, one of the most prolific scorers of all time, holds the top four spots for most field goals made in a season and has the two top field goal percentages for a season. One of the greatest field-goal shooters of all time is Michael Jordan, who led the NBA in field goals made ten times. Shaquille O'Neal has the record for most seasons (10) with the best field goal percentage, and Artis Gilmore has the record for highest career field goal percentage (59.9%). Steve Nash was one of the greatest all-around shooters in the history of the NBA, holding the record for 50–40–90 seasons, a mark of all-around shooting for two-point field goals, three-point field goals, and free throws. Nash recorded four of the eleven 50–40–90 seasons in NBA history. One type of field goal is called a slam dunk. This occurs when a player jumps near the basket with possession of the ball, throwing the ball down through the basket while airborne. The word "slam" is derived onomatopoeically from the sound of the player's hands hitting, grabbing, then releasing the hoop. ^ "Steve Nash career statistics". Basketball Reference. Retrieved May 20, 2010. Joseph Franklin "Jumping Joe" Fulks was an American professional basketball player, sometimes called "the first of the high-scoring forwards". He was posthumously enshrined in the Naismith Memorial Basketball Hall of Fame in 1978. Stephen John Nash,, is a Canadian former professional basketball player who played 18 seasons in the National Basketball Association (NBA). He was an eight-time NBA All-Star and a seven-time All-NBA selection. Twice, Nash was named the NBA Most Valuable Player while playing for the Phoenix Suns. He currently serves as general manager of the Canadian national team and as a player development consultant for the Golden State Warriors. Predrag Stojaković, also known by his nickname Peja, is a Serbian professional basketball executive and former player. He is currently the director of player personnel and development for the Sacramento Kings. Dirk Werner Nowitzki is a German former professional basketball player. An alumnus of Röntgen Gymnasium and the DJK Würzburg basketball club, Nowitzki was chosen as the ninth pick in the 1998 NBA draft by the Milwaukee Bucks and was immediately traded to the Dallas Mavericks, where he had played his entire 21-year National Basketball Association (NBA) career. 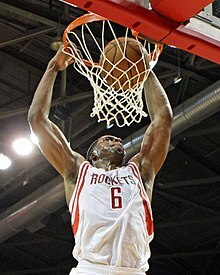 In the NBA, he won the league Most Valuable Player (MVP) award in 2007, was an NBA champion in 2011, and was a 14-time All-Star. William Mark Price is an American former basketball player and coach. He was most recently the head coach of the UNC Charlotte 49ers. 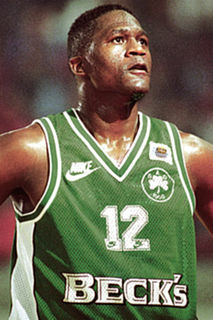 As a player, he played for 12 seasons in the National Basketball Association (NBA), from 1986 to 1998. Spending the majority of his career with the Cleveland Cavaliers, his last three years consisted of one season each with the Washington Bullets, Golden State Warriors, and Orlando Magic. John Joseph "Hondo" Havlicek is an American retired professional basketball player who competed for 16 seasons with the Boston Celtics, winning eight NBA championships, four of them coming in his first four seasons. Kyle Elliot Korver is an American professional basketball player for the Utah Jazz of the National Basketball Association (NBA). He played college basketball for the Creighton Bluejays and was drafted in the second round of the 2003 NBA draft by the New Jersey Nets. He was immediately traded to the Philadelphia 76ers. After four and a half seasons in Philadelphia, he was traded to the Jazz. 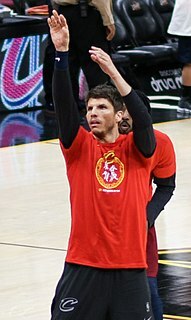 During his first stint with the Jazz, in 2009–10, Korver shot 53.6 percent from three-point range, which set an NBA single-season three-point field goal accuracy record. In 2010, he joined the Chicago Bulls. In 2012, he was traded to the Atlanta Hawks, where in 2015, he was named NBA All-Star. In 2017, he was traded to the Cleveland Cavaliers, where he was a member of back-to-back Finals teams. In 2018, he was traded back to the Jazz. Damon Darron Jones is an American retired professional basketball player, and former member of the coaching staff for the Cleveland Cavaliers of the National Basketball Association (NBA) as a shooting consultant. A three-point field goal is a field goal in a basketball game made from beyond the three-point line, a designated arc surrounding the basket. A successful attempt is worth three points, in contrast to the two points awarded for field goals made within the three-point line and the one point for each made free throw. Informally, the 50–40–90 club is the group of National Basketball Association (NBA) players who have had a shooting percentage at or above 50% for field goals, 40% for three-pointers, and 90% for free throws during an entire NBA regular season while also achieving the NBA minimum number of makes in each category. A total of eight players have had 50–40–90 seasons. 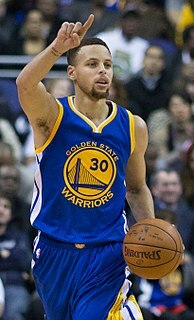 This page details the records, statistics and career achievements of American professional basketball player Stephen Curry. Curry is a point guard for the Golden State Warriors of the National Basketball Association (NBA). He previously played collegiately for Davidson. Holding numerous records related to three-point shooting, Curry has played nine seasons in the NBA, where he is a five-time All-Star, two-time Most Valuable Player, and a three-time NBA champion with the Warriors in 2015, 2017, and 2018.